I been saving this one till the end. Dawn of the Dead has everything! Not only is it post-apocalypse (and not even by Nuclear War), it is also one of the goriest movies ever. O.K., O.K. Maybe you never seen it... I'll fill you in. It's part two of Night of the Living Dead. Zombies have taken over the world. Some hapless adventurers flee in a helicopter and manage to take over a mall. Bikers come in and try to fight them. Most of them die. They escape in the end. The End. But man, it's so much more than that. They manage to secure the mall and rid it of zombies. Then it is like a scavengers dream come true. They make whatever food they want. They loot the gun and knife store for all of its wares. I mean, they have everything they could ever want. Of course they get bored of it all, which isn't surprising, but I think I could've handled it. Just let some zombies in every now and then and hunt for them. Sheesh. Maybe take up a hobby, like naked turtle racing. The special FX in Dawn of the Dead are some of the best! What about that zombie that steps up onto a box and walks right into spinning helicopter blades. I’m still not exactly sure how they did it! Get the ultimate DVD edition. In the special features, they explain how they did that gag. Tom Savini built up the actor’s skull with latex, which is why he looks so Frankensteinish. The helicopter wasn’t running when they filmed it. The turning blades were added in post production. Savini wound some fishing line inside the latex appliance and filled it with bloody goo. When the actor climbed the boxes, an assistant held the other end of the fishing line, then ran as fast as he could. The line became taut and ripped the appliance away. The goo splashed and voila! Instant SFX classic! Nice! Savini is the best! 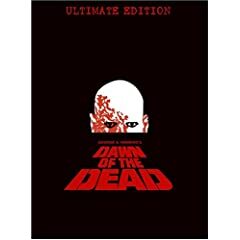 My father took me to see Dawn of the Dead at the theater back in 1979. I was eleven! The movie was considered to be so violent the ratings people were going to give it an X. So Romero and Rubenstein and the other money men decided to release the movie on their own dime without a rating. Needless to say the movie completely flipped me out. After it was over I remember dad telling me to not get real detailed when telling mom about it. But I never forgot the movie. Dawn of the Dead at age 11?! Holy smokes, it’s a miracle you aren’t in the looney bin. Wait, you aren’t right? I love the part where your Dad wants you to keep the gory details from Mom. Total classic Dad move. Heh.